These cookies accomplished a number of things: (1) they helped me clean out my pantry of an alarming amount of chocolate that I needed to use up; (2) they kept me interested in Christmas baking; and, (3) they put me into a chocolate coma. Can life get much better than that? I am so glad I followed Dorie’s instructions and used premium chocolate (the white chocolate chips that I used were Nestle, but I didn’t skimp on the other chocolates). I used a combination of Ghirardelli, ScharffenBerger, and Valhrona. 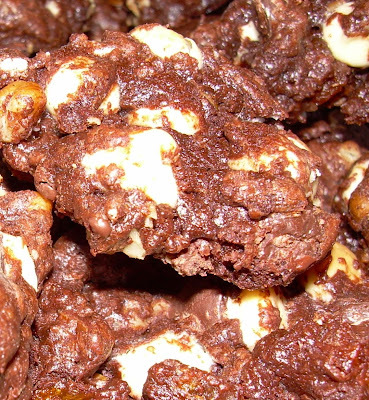 These cookies are dense, gooey, and intensely chocolatey. 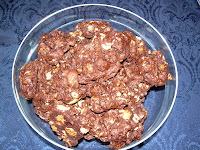 The white chocolate chips provide a startling contrast to the richness of the dark chocolates. I used dried apricots and pecans in the recipe, but next time I might try craisins like Brilynn did over at Jumbo Empanadas. 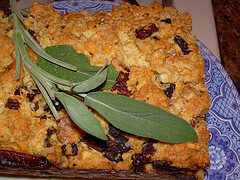 At My Feasts, Maya used raisins and pecans. I don’t like cookie dough (I know, weird), but I had to restrain myself from eating this batter out of the bowl – that’s how good it was. A few final thoughts. I thought that the apricots were a tad bitter, so I’m going to try another fruit next time. I also think these cookies are not particularly kid friendly (especially with the apricots), unless the child in question has a taste for something other than milk chocolate. Finally, don’t make the cookies too small. I found that a golf-ball sized blob of dough gave me a lot of cookies, yet maintained the gooey consistency inside. Now THIS is chocolate cookie dough! Center rack in the oven and preheat oven to 350 degrees F. Line 2 baking sheets with parchment paper or silicon mats (don’t skip this step). Beat eggs and sugar on medium high speed until mixture is pale and foamy. Reduce speed, add vanilla. 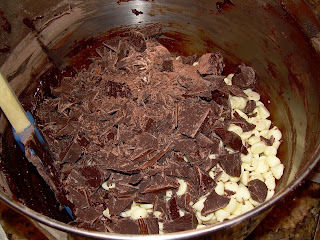 Then add cooled melted chocolate, and mix only until incorporated. Add dry ingredients. Do not over mix. Dough will be thick and shiny. Try not to eat all the dough out of the bowl. Cool cookies. These freeze very well. I am a big fan of Dorie Greenspan’s book, Baking: From My Home to Yours . Her descriptions of each tasty treat, along with wonderful pictures, are enough for me to put on five pounds, just by reading. Alas, I do not have Kathy’s (of A Passion for Food) metabolism. That girl can eat! So, I decided to try her Cream Scone recipe. Delicious. These are flaky with a rich, buttery taste. Ah, butter. Further proof that God loves us! Of course, I snatched one up right out of the oven – I should have listened to Dorie and let them sit for about 10 minutes. 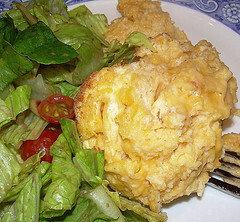 The flavor will really develop during that time, and the scones will pull together and not be quite as crumbly to eat. There was a small mistake in the recipe (it called for currants but did not include an instruction for adding them into the dough). 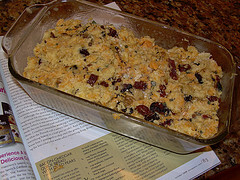 I tweaked it a bit to suit my tastes: I eliminated the currants and added chocolate chips, plus some vanilla bean paste. If you don’t have the paste, substitute two teaspoons of vanilla extract. Dorie gives great instructions on how to make the scones by hand, but they are a snap to put together if you mix the whole batch in a food processor so that you don’t over mix the butter or the dough. Center a rack in the oven and preheat it to 425 degree F. Line a baking sheet with parchment or a Silpat. Stir together the egg, cream, and vanilla bean paste. In a food processor, pulse together the flour, sugar, baking powder, and salt. Add the butter and pulse about 5 or 6 times, until you have a mixture that includes both pea-sized and smaller pieces of butter. Add the cream mixture and pulse two or three times. Do not over mix! You will finish pulling the dough together in a moment. It should still appear rather crumbly. Lightly dust a work surface with flour and turn out the dough. Gently work in the chocolate chips. Knead only about 8 to 10 times as you pat the dough into a circle, about 3/4 of an inch thick. 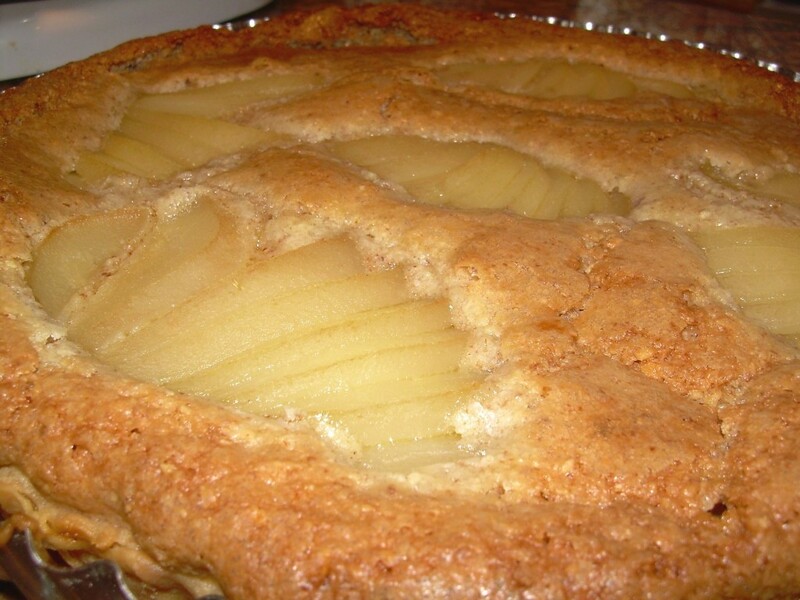 With a sharp knife, cut the circle into six wedges and place on prepared baking sheet. Brush tops of scones lightly with cream or milk, then sprinkle with sugar. Bake 20-22 minutes until tops are golden and firm. After removing from oven, let scones rest for about 10 minutes before eating them. If you have the willpower to do so, that is.